In a large skillet, medium to high heat, add 4 tablespoons olive oil. When hot, add onions and saute until soft. Turn heat to high and add garlic and chicken. Toss until chicken is cooked and browned. Add lemon juice and zest. Season with sea salt and black pepper. Add sundried tomatoes and parsley, then stir to combine. Drizzle extra virgin olive oil over the top. Sprinkle with fresh parsley. 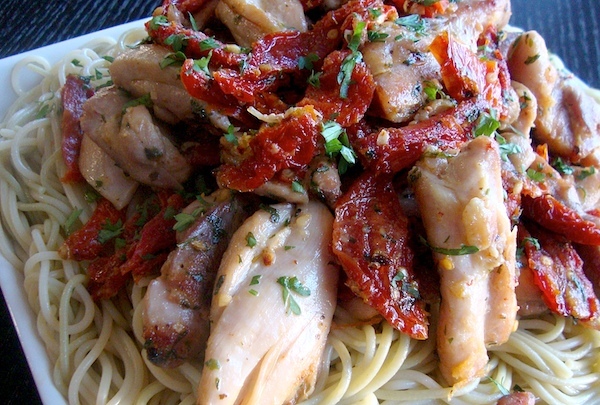 Serve hot over pasta of choice. I love everything about this dish...YUM!